Slots Garden Casino is a popular online casino powered by Realtime Gaming – and as you’ll see from this review, the casino caters to a variety of players, and offers a superb range of games. It also allows for both conventional and unconventional payment methods – and you can find out all about them here, in our Slots Garden Casino review. Slots Garden doesn’t offer a standard welcome bonus offer – but they do have a cool promotion which we’ll cover below. They also regularly release coupons (these are usually sent in emails to customers), and these are easily redeemed once you’re logged into your account. Now, whenever you deposit at the casino, you can use the code ‘SLOTS100’, and this will give you an additional 100% bonus money on top of your deposit. Perfect if you’re looking to get a bit more bang for your buck. The deposit bonus is considered non-cashable, and the wagering is set at 30X for slot games and 60X if you’re playing table games. 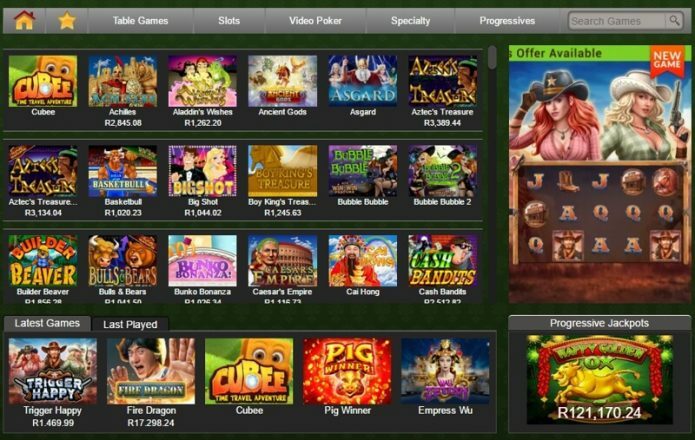 As mentioned, Slots Garden is powered by Realtime Gaming, and as a result, you can expect to see all of RTG’s games available at the site. The biggest type of game offered is undoubtedly video slots, and you’ll find hundreds of games to choose from, and also new slot game releases almost every month. They also offer a small selection of classic slot machines. These are much like video slots, yet without the bells and whistles commonly associated with video slots. Now, if you’re a fan of table games, you’ll be spoilt for choice at Slots Garden, and they offer a plethora of titles for you to enjoy. You’ll find multiple variations of Roulette and Blackjack – and there’s also Craps and Keno available too. These games can all be accessed from their respective tabs on the ‘Casino Games’ page. There’s also a selection of Video Poker titles for you to enjoy as well. Again, these can be accessed by first heading to the ‘Casino Games’ tab, and then to the ‘Video Poker’ tab. Unfortunately – at the time of writing – there aren’t any live dealer games available at Slots Garden. Whether this will change in the future, we don’t know. Slots Garden Casino allows you to make deposits in a number of ways. You can always view the list of payment methods from their ‘Banking’ page, which can be found linked at the bottom of their website (in the footer area.) The methods you’ll be able to use to deposit include VISA, MasterCard, Bitcoin, EasyEFT and Skrill. When it comes to payouts, you can withdraw your funds using EasyEFT or Skrill. We are slightly surprised to see that Bitcoin isn’t listed as a method for withdrawals, but the two above should be sufficient for most players in most cases. When it comes to withdrawal time-frames, Slots Garden Casino is pretty good, and you can generally expect to see your withdrawals processed in around 24-48 hours. It can be shorter than this – and subsequently, during busy periods it may take a little longer. Slots Garden Casino realise the importance of good customer support – and that’s why they have a dedicated support team, working 24 hours a day, seven days a week to help you with any problems or issues you may be experiencing. There are a few ways you can get in touch with the customer support team, and the easiest way is to use the live chat facility. Slots Garden Casino is one of the better options for South African players today. Their site is extremely secure, versatile, and safe – and you shouldn’t have any problems signing up, depositing at, and playing at their site. We like the fact that Realtime Gaming powers their games which means you can enjoy the action knowing you’re playing in a safe, fair, and integral environment, and you shouldn’t have any issues using their software. We also like the fact that they offer 24 hours a day, seven days a week customer support, as this means if you do experience any problems, you can quickly and easily get the help and support you need.